Cyclists in the City: In 2008, the Mayor promised 'a London where children & adults cycle and walk to school or work and feel safe to do so'. Today he announced a review of his cycle strategy. Can London's cyclists trust him? In 2008, the Mayor promised 'a London where children & adults cycle and walk to school or work and feel safe to do so'. Today he announced a review of his cycle strategy. Can London's cyclists trust him? make this sort of thing normal? "The Mayor of London has met with the family of Brian Dorling, a cyclist killed in east London on October 24, and expressed his condolences for their loss." a) Immediate review of all major schemes planned on TfL roads and all junctions on the existing Cycle Superhighways. That review will look at all options for ensuring that the safety of cyclists, pedestrians and all road users remains paramount. Bow roundabout will be studied first with results available 'within weeks' - remaining junctions by the spring. b) Reviews of construction industry vehicles and various marketing campaigns focussing on road safety. c) The development of these initiatives will seek the input of a wide range of stakeholders, including the construction and haulage industries, cycling groups and local representatives from across the capital. There's lots of promise in this release. But as I mentioned last week, so much of this 'review' has already happened. For over six years, Transport for London consulted - through a number of expensive consulting firms - with thousands of cyclists and other 'stakeholders' about every single main junction in London. There's a massive database of the stuff. You can go and look at it yourself here. However, as I mentioned last week, Transport for London has so far ignored that vast amount of research and there's very little evidence of it being taken into account at any of London's major junctions. Fancy joining this cycling here with your kids? Cycle Superhighway coming right here soon! It is significant that the Mayor acknowledges something needs to be done. And good on him for putting this on the agenda. This being politics, I can't help but notice the 'review' won't finish until the spring - ie just in time for the Mayoral elections. In other words, I sense that London cyclists are at last on the political map. And staying there. However what really isn't clear to me is what any of this means. What is a 'review' exactly? Who does the 'reviewing'? Will it be the same people who designed many of these schemes in the first place or will it be people with any empathy at all for cycling and walking? 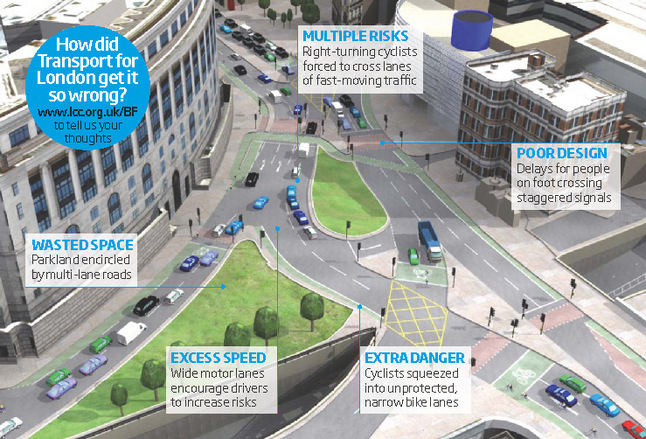 Will it be people who might actually ever cycle through these junctions? When I met one of the TfL officials responsible for the original (slightly modified since) Blackfriars, she was genuinely stunned that I felt her scheme was a complete betrayal of pedestrians and people on bikes. In other words, I'm not sure if we can trust this development. What I will be watching is Bow roundabout. Bow is the first junction to undergo review and something is supposed to happen 'within weeks'. 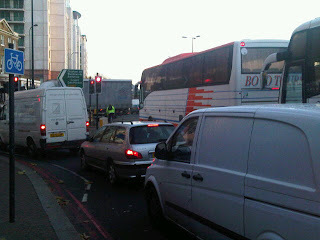 I think Transport for London needs to show it is prepared to implement radical changes at Bow. That junction must not simply be 'reviewed' but the changes must be implemented. And fast. I believe that cyclists are looking for a watershed from Transport for London and the Mayor. A few weeks ago, the Mayor described Elephant & Castle roundabout as a place that anyone could cycle through provided they 'kept their wits about them'. Frankly, that isn't good enough. What I feel needs to change is an attitude from the Mayor's office and from Transport for London that assumes normal, everyday people are happy to fling themselves on bicycles across multiple lanes of fast-moving motor traffic. They need to feel they are able to use Cycle Superhighways safely not just from 7-10am when the bus lanes operate but at night, on the way home from shifts at the hospital. 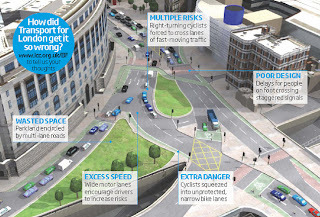 They need junctions that look and feel sensible to cycle through. And they need to be able to feel they can cycle with their kids. So many people have contacted me saying they wish they could have joined the recent Tour du Danger but were worried about cycling in London with children. I think it's terribly sad London has evolved into a place where you can't feel safe on the street with your kids. "If I was in charge of the transport system and I told my engineers to design roads that speed motorists along at the expense of pedestrians or cyclists, then that is different. People can die and do." She hits the nail on the head. This is exactly what local bloggers in Bow like DiamondGeezer are quite rightly furious with the Mayor for rendering it impossible to safely cross the road at Bow roundabout. Jenny Jones continues by pointing out elsewhere: "The Mayor...wants roads that are safe for him to cycle around. In contrast, I am an experienced cyclist who wants roads that are safe for a twelve year old to cycle on. That is the gulf between us." death trap. It's not necessary. And that's the thing. This could and should be a debate about what sort of London we want to live in. Do we want a London where people are designed out of the streets so that more and more motor traffic can pump through the network? Or do we want people to feel they can choose quite happily to just get on a bike or walk. Remember that TfL admits roughly 50% of all car journeys in outer London are under two miles. People are driving because it's just easier and feels safer. We have to choose if we want to go on with crap air quality, crap congestion, crap petrol costs. Or if we want the Mayor to give us a choice. Remember, this is the Mayor who scrapped the pedestrian and cyclist bridge over the Thames. This is also the Mayor that scrapped plans to turn Whitechapel High Street (part of the Olympic Cycle Superhighway) into a calmer High Street with space for cycling. The same Mayor that scrapped plans to make Parliament Square calmer and safer by closing one side to motor vehicles. The same Mayor that allowed Transport for London to ignore its own long-standing commitment to making Blackfriars junction safer. And even more importantly, this is the Mayor who first launched the Cycle Superhighway scheme shortly after he sold Londoners a vision of: "a London where children and adults cycle and walk to school or work and feel safe to do so." Sounds similar to the language of Jenny Jones, doesn't it? Except in reality, when he had to nail his colours to the mast, Boris Johnson actually told those children to man up and just fling themselves around Elephant roundabout. Err, I think not. This is the Mayor who completely ignored the early warning signs. Back in summer 2010, The Telegraph's Andrew Gilligan was saying this about Cycle Superhighway 7: "the route is pointless, verging at some places on the dangerous". Same story repeated all over again. What this comes down to is whether or not you can trust the Mayor to come good on this review. Bow is his first chance to get it right and to undo the massive amount of damage I think he has done in recent weeks. It had better be a bloody good review. And an even better commitment to deliver. And there needs to be tangible evidence of more to come. At Blackfriars, for example. And at Oval. All places where cyclists have been killed in the name of faster motor traffic. He promised last time. And he massively under-delivered. This time, his review will be complete by the spring. But he has to show delivery at Bow and elsewhere in London before the spring. Otherwise it's just more empty promises. To put it the other way: Boris is very public about being friends with cyclists. Just see how cyclists react. Now imagine if you're *not* his friend. But no, I have no trust on Boris, his actions speak volumes. But then again, given the current government I'm not sure if he's below or above par in local standards. Boris promised 'a London where children & adults cycle and walk to school or work and feel safe to do so'. He's already broken that promise, why should cyclists and would-be cyclists who have been frightened-off, believe he deserves a second chance? Why should anyone trust him? What about the children? He's shown himself untrustworthy. He says one-thing and does anything but that, I'm not sure cycling could survive a second-term of Boris. How many cyclists must be sacrificed on the altar of more and faster motor-vehicles while Boris chants the mantra 'keep your wits around you'? Politicians need to be trustworthy.
" In other words, I sense that London cyclists are at last on the political map. And staying there." Let's show him what time it is Boyeeee! I had a meeting with the project manager of CS7 as it was being made. I rode with him southbound so he could explain various things about design etc... I sense that the people designing the roads had very little experience of actually using them. I can tell you on CS7 where the danger spots are just from my experince, something which can't be done from looking at it on a map. I just saw this article on the BBC - http://www.bbc.co.uk/news/uk-england-london-15846847. In the general London section, not transport. "All's fine as long as you keep your wits about you! Carry on"
I lost all trust in Boris and the only thing that can make me trust him again is quality infrastructure installed in place of the CSHs. Keep up the pressure Danny! Thanks for all you've done! Nowhere is there a commitment to provide the proper infrastructure which will make it possible for children (and adults for that matter) to cycle safely in London. It's great that the profile of cycling has been raised, but now more than ever we need to keep the pressure up. When's the next protest ride? Surely increasing cycling provision is one way forward?